These Christmas M&M Chocolate Chip Cookies are just a festive version of my favorite chocolate chip cookie recipe. 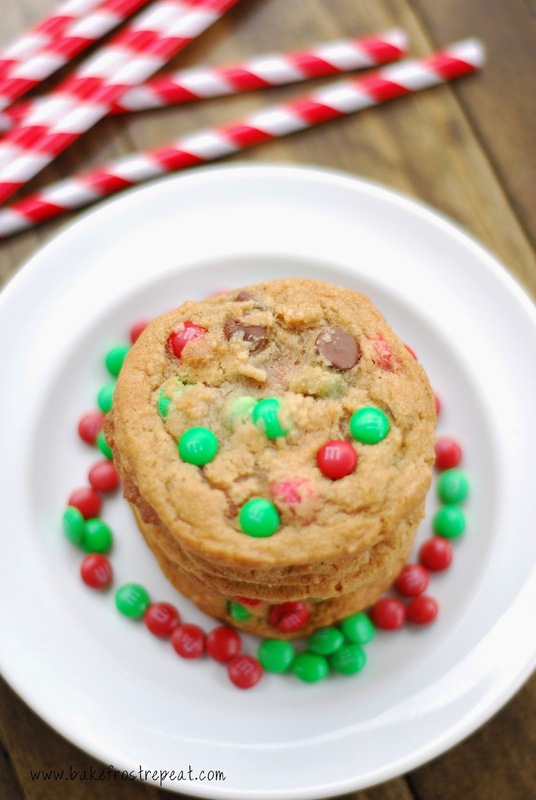 Chocolate chip cookies are my favorite cookie and I love how you can just Christmas these cookies up with the simple of addition of festive colored M&Ms. They are also easy to make and incredibly delicious. Are you cookied out yet? I think I am. I get so worked up this time of year, planning and preparing and chopping and mixing and stirring and rolling and baking........I could go on. And while all this work exhausts me (it seems to be getting worse every year......thanks a lot, 40! ), I love doing it and will continue doing it for as long as I can. It's just what I do. So if you are already exhausted by just thinking about making something for the holidays, make these M&M Chocolate Chip cookies. People will think you were in the kitchen all day long. Combine Crisco, brown sugar, milk, and vanilla in large bowl. Beat at medium speed until well blended. Beat egg into creamed mixture. Combine salt, flour, and baking soda. Mix into creamed mixture just until blended. Stir in chocolate chips and mini M&M candies. Bake one sheet at a time for 8-10 minutes. I could eat the whole plate of these cookies. They look delightful! Such a classic! We made these this year, too! This food I like to do it. Many people who come to this site are really interested in cooking for anyone who wants to cook can read the page at all.